Many of you will be surprised that the following looks have been recycled from previous decades. All are fashion trends that have been loved in a different fashion era that we are lucky enough to appreciate once more. 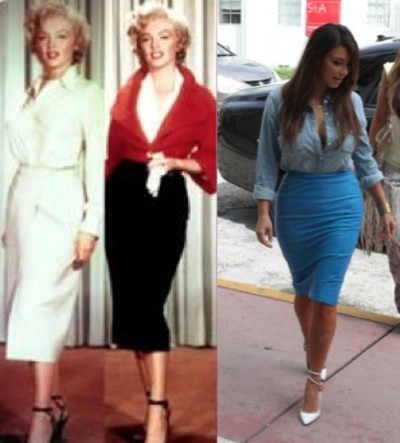 Famously worn by the curvaceous celebrities of the 50’s including Marilyn Monroe and Sophia Loren, silhouette pieces especially the pencil skirt has made a comeback. Fitted and molded to your body, styles in this caliber will accentuate the right curves. Stick figure, malnourished models are out and the curves are in! Worn by some of the most curvaceous bodies of our era including Kim Kardashian, this style will be a winner as long as you own the look and be confident. This is one of the most comfortable dresses anyone can wear. Free flowing and perfect for summer, this is a great style to show of your killer legs. There are so many different styles you can purchase whether you are looking for a casual baby doll dress or a formal one. Be aware that it can make you look like a tent if you do not purchase the right size. Speak to your shop assistant and get them to help you fit the perfect one. Made popular in the era of ‘Staying Alive’, the platform heel has made a compelling comeback and is here to stay for a long time. With every heel lover having a pair of platform heels in their collection, they are not only stylish but also extremely comfortable compared to the stiletto. They give you great height, and due to their popularity, there are so many colours and styles to suit you and your budget. The 80’s brought out the animal prints. Now we see many people owning this look by adding a print to their outfit. A word of advice, do not over do the print, just wear one item, such as a top, pant or an animal print accessory. Too much print can look tacky. Also known as the harem pants, Ricky Martin has made this look a trend once again. It is definitely a look not everyone can wear, but when it is pulled off, it looks great. Although fashion has evolved, we keep seeing patterns of repercussion. Why not try one of these styles and recreate something old with a twist of current fashion.